Who doesn't love getting away and just taking some time out to relax and reconnect with yourself and those around you? There's something really special about doing something completely spontaneous and slightly rebellious and as you may have seen on my social media last week I spent a lovely mid-week stay at the Fistral Beach Hotel & Spa doing just that! So, I thought I ought to share the love with you and have written a little blog about this awesome Hotel which has arguably some of the best views in Newquay. Taking the stairs to my room and walking through the corridors I couldn't help reading all the cute little quotes that were scattered around especially "start the day with a smile and finish it with champagne “ my kind of thinking! Now we're talking, I was really starting to get into the swing of things and was so ready for a chilled evening of drinks and good food. Walking through the door I was instantly blown away as the first thing that hits you are THOSE VIEWS!! You're so close to the ocean its like having a room on the beach it was beautiful! The room itself is a huge private living space divided in two with a stunning modern bathroom complete with freestanding bath (also overlooking the Bay!) on one side and possibly the softest, comfiest Queen Size bed on the other - believe me when I say this room is pretty much Instagram goals! Wanting to start the afternoon off with a chilled vibe I ordered a bottle of champagne to the room. Popping it open I started to run myself a huge bath of rose scented bubbles and took the champagne out onto the balcony for a brief moment, listening to the the waves and watching the surfers. The Hotel's Dune Resturant with its stunning white draped curtains and pretty little candles everywhere is the perfect place for a romantic date night! Our table by the window overlooked the beach...... with that amazing view...... once again, how lucky! Not sticking to the diet and with a great selection of fresh Cornish produce we indulged ourselves with the most delicious three course meal and a nice cold bottle of wine. It was so yummy, but we did end up sharing the sticky toffee pudding desert as we were just so full. It was really lovely to try the food in the Dune Restaurant as I've only ever eaten in the Hotel's Lounge Bar before (which also has a great menu also by the way!). I love that the Hotel is able to offer you the choice as sometimes you want to dress up for a special Dinner and sometimes its just feels right to go for a more chilled vibe in the Bar - all depending on the mood you're in! As always eating a lovely meal normally means one thing...crash & burn! My bed was calling and the all that sea air had made me feel really sleepy. Back in the room I opened the balcony door as I love the sound of the waves at night, its so relaxing and such a lovely sound to fall asleep to. Keeping one curtain open would mean waking up naturally to the sunrise over the beach the next day too. Drifting off was easy in the softest of beds and I had a really peaceful nights sleep looking forward to our spa visit the next morning. Not having to set an alarm for once we enjoyed a luxurious lie-in sipping coffee and watching the surf before heading down for breakfast in the Dune Restaurant. It was a beautiful sunny morning and the chilled vibes continued as we tucked into a hearty breakfast. Instead of the traditional English breakfast I decided to go for the freshly cooked Waffles with yogurt and berries, with just a drizzle of honey on top, although it was a hard decision between that and the Eggs Benedict - but in the end my sweet tooth won! We had decided to spend the morning in the Hotel's Spa area and what a treat we were in for as we picked the perfect time, it was super quiet and for a while we had it all to ourselves. 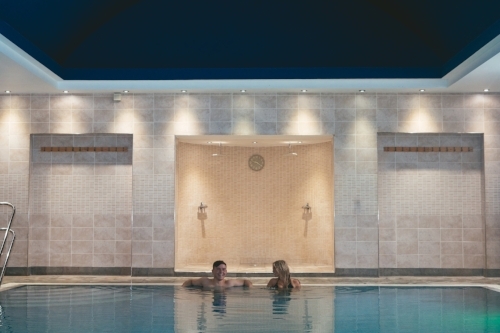 The moment you step into the Spa the warm air hits you, the large tranquil pool is surrounded by star lights and water fountains which are great for an invigorating back massage. We started off in the Jacuzzi and just let our breakfasts settle followed by a poolside shower before going into the eucalyptus scented steam room. A few leisurely swims later and some time in the sauna, feeling refreshed and relaxed we headed back to our room in time for our 11am check out. Having watched the surf for basically the last 24 hours we couldn't not head in and grabbing our boards from the car we spent the rest of the morning in the surf. If you come to Newquay you have to try surfing! The Fistral Beach sister Hotel, The Esplanade, just 2 minutes away offers surfing lessons from their in-house Quiksilver Surf School. If you don't fancy surfing, there's so much to do and so many beautiful places to explore right on your doorstep. Thank you Fistral Beach Hotel for making us feel so welcome and like real life Rockstars!